Trials Riding is the most popular participation motorcycle sport and certainly the cheapest and easiest to take up and provides a basis of machine control that can be utilised in all other forms of motorcycle sport. A trial is a series of observed sections over natural obstacles like streams, hills, rooted climbs and muddy banks, which the rider attempts to ride without putting their feet to the ground. Penalties are lost for touching the ground with one mark for a “dab” – touching the ground once whilst in the section, two marks for two dabs, three marks for “footing” – three dabs or more and ve marks for a failure, coming to a halt in the section. There are classes for riders from virtually any age, the youngest class being for riders from four years old on electric bikes, with riders aged over 75 still riding regularly. Girls and ladies are also catered for in the same class structure, with more than 100 females currently riding regularly in the UK, so there is a class for riders of all ages and abilities, so it really is a sport for both the young and old. There is a wide variety of machines available from small wheeled electric bikes up to 300cc two stroke and four stroke machines as well as there being classes for machines with twin-shocks and for machines manufactured prior to 1965 together with replicas of such machines. There are many hundreds of clubs in the ACU that organise trials and it is rare that a potential competitor needs to travel for more than an hour to attend his nearest event on almost every Sunday throughout the year. Many clubs also hold series of summer evening events and also Saturday afternoon series. The minimum requirements to take part are a bike (of course), an open face helmet and sturdy leather boots and suitable gloves. The ACU is the governing body for Motorcycle Sport in the UK, less Northern Ireland. There are more than 260 clubs running trials in the UK that hold events from club to national status and British Championship events. Do I need a licence to compete in a trial? 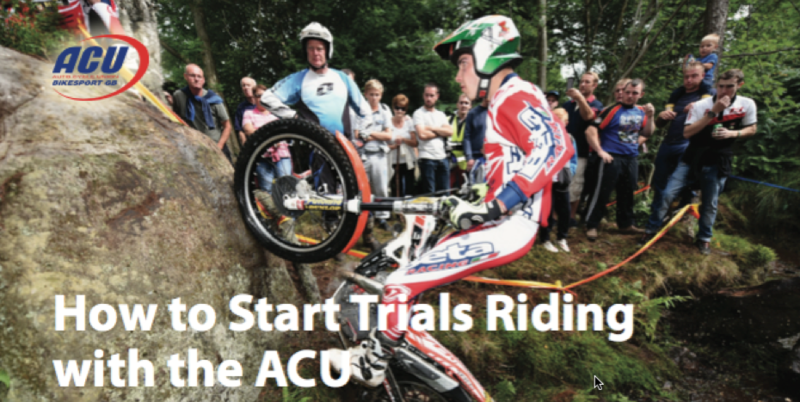 There is a requirement to be the holder of an ACU Trials Registration Card prior to taking part in a trial. They cost £10 annually and are very easy to obtain. Select a club of which you wish to be a member and contact the secretary. The Secretary will sign you up to the club, usually for a small fee and sometimes without charge and then issue you with an ACU Unique Number. You then download a ACU Trials Registration Card application form from the ACU website – ACU.org.uk, complete the form and enter the Unique Number you have been given, then send the completed form to the ACU, or do it all online. Within a few days you will receive a Trials Registration Card which permits you to ride in any club’s event within the UK. The ACU holds a list of all clubs in the area in which you are interested that organise trials. Many clubs have their own website with dates and venues and of course there is also weekly newspapers and trials orientated websites to locate the details of events. Decide upon the event in which you wish to take part and depending upon the information immediately available to you, either contact the secretary or simply turn up at the event. Many club trials are “enter on the day” when you arrive, complete an entry form, pay the entry fee and take part. Other clubs require you to enter in advance and more important events such as national trials and national championship rounds require you to enter in advance. Check out our Clubs Page for details of clubs in the ACU Eastern region. Find a forthcoming event near you in our Events Calendar on the Homepage of this website. Is it easy to take up trials riding? Basically, yes it is. If you have some off -road riding experience, even if only a little, it will stand you in good stead. Don’t try and ride a more di cult route within the trial than you can easily cope with. It’s much better to enjoy an easy route rather than a hard route and then go home feeling it’s not the sport for me. What do I do when I arrive at a Trial? Arrive about an hour before the advertised start time and enter the event if you haven’t already done so in advance. Entry fees vary from club to club but are usually between £15 and £25. Change into your riding clothing and when advised to start, take part in the trial. It’s likely that most of the events that you first enter will be all off -road so there will be no need to have your machine taxed or insured for road use, though of course it is wise to take out theft insurance as you would for any other valuable item. Most events are held over fairly short courses of between one and six miles with riders expected to cover a number of laps over a number of sections. Frequently it will be three laps of 12 sections or four laps of 10 sections, sometimes two laps of 20 sections. Is there a class for me? Undoubtedly there will be. Clubs have very different class definitions and there is no recognised standard between events. Most events will cater for youths, adults and riders over 40 years of age and sometimes twin-shock and Pre 65 machines. Events will often have up to four different routes within each section so it is important to know in advance which set of section flags/markers you need to ride between for your particular class. How do I get some practice in before a competition and what about the bike and clothing? There are numerous reputable dealers around the country, most of which will know of local practice areas., and they can also advise on clothing, boots and helmets. It is not necessary to be the owner of a brand new or even a fairly new bike to be competitive. Trials bikes don’t get particularly hard use and you can be equally competitive on a well maintained10 year old machine as you can on a new machine. The sport is very much more about the ability of the rider than it is about the machine. Youths are restricted to a maximum capacity of 125cc up to the age of 16 when they can choose to remain as a youth for a further year, or become an adult for the purpose of the sport when they can ride a machine of larger capacity. Trials riding is a brilliant sport in which it is possible to ride throughout your active life and remain competitive within your class. Additionally, trials riding is the best way of understanding surface conditions, throttle control and safety. The bulk of well-known bike racers, both on and off road, have come through trials riding as youngsters or use the sport to keep fit for their preferred discipline.